"A nice change from the traditional sweet zucchini muffin, this recipe utilizes zucchini, onion, garlic, roasted red pepper, and sun-dried tomatoes, resulting in a moist, savory muffin that's perfect at breakfast, lunch, or dinner time! You can sprinkle with a little shredded parmesan before baking, if you like." Preheat oven to 375 degrees F (190 degrees C). Grease 16 muffin cups or line with paper liners. Heat 1 tablespoon olive oil in a skillet over medium heat; cook and stir the onion and garlic in the hot oil until the onion is translucent, about 5 minutes. Stir in the sun-dried tomatoes and remove from heat; transfer to a food processor. Add the zucchini and roasted red pepper to the tomato mixture; pulse the mixture several times until finely chopped. Stir the all-purpose flour, cornmeal, whole wheat flour, baking powder, baking soda, salt, pepper, basil, and oregano together in a bowl. In a separate large bowl, beat the butter with the sugar until fluffy using an electric mixer; beat in the eggs, one at a time. Stir in the sour cream, milk, hot pepper sauce, and 1 tablespoon of olive oil. Stir half the flour mixture into the butter mixture until almost incorporated; add the rest of the flour mixture and stir a few times just to mix. Stir in the zucchini mixture. Spoon the batter into the prepared muffin cups until nearly full. Sprinkle each muffin cup with about 1 teaspoon of shredded Parmesan cheese, if desired. Bake the muffins in the preheated oven until golden brown, 35 to 40 minutes. Allow to cool for 10 minutes before removing from pans. 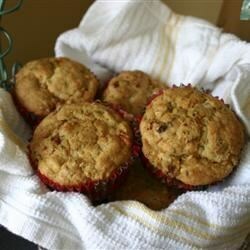 These Savory Zucchini and Chard Muffins are just right for brunch or lunch.